NOTE: Since this post was written, the AIP community has come out with an incredible ebook called 85 Amazing AIP Breakfasts with literally tons of breakfast recipes and inspiration. If you are still struggling with breakfast on AIP, be sure to check it out! Ever since I started taking breakfast seriously, I have really grown to enjoy it and it is now my favorite meal. I try to set myself up for success by eating the most nutritious meal first thing in the morning. Since I started eating this way, I have found that I have more energy during the day and I am less hungry for snacks, and sometimes even have to remind myself to eat lunch (coming from someone who used to suffer from chronic hunger, this is huge!). If I end up in a pickle later in the day without AIP-friendly food to eat, I can easily get by on some fruits and veggies until I get home and can cook something. This really cuts down on my diet related stress, as I used to worry a lot more about always having food with me at all times. What is your favorite autoimmune protocol breakfast? Have you found any tricks that you would like to share? Thank you so much for sharing and for your information. You are really a Blessing! Yummy! I had read on a Paleo site somewhere recently that skipping lunch really shouldn’t be a big deal — a big Paleo breakfast ought to get you by until a nice Paleo dinner around 4 or 5 PM. I alternate between constant hunger and never hungry and still have days where I’m “bad” and don’t eat anything all day, especially if I don’t have any easy-prep stuff in the fridge or freezer. All of that looks fantastic — no wonder breakfast has become your favorite! I am definitely not at the point of 2-meals-a-day yet either — I remember those stream-of-carb days and I start to worry a few hours after my last meal where my next snack is coming from! My breakfasts are kind of similar- usually some type of veggie stir fried in coconut oil with a piece of meat or fish. I really want to add in bone broth and fermented veggies but haven’t attempted to make them yet. I’m kind of intimidated, even though I know everyone says they’re easy to make. I’m also a little worried, because I heard that for some people, fermented veggies cross react with gluten due to the yeast. I have Celiac and Hashimoto’s, and still have a long way to go towards healing my gut. You seem to tolerate them well though, right? So hopefully I’ll be okay, once I finally make some. I have the best luck at my local farmer’s market for bacon. When you shop at a mainstream store, you usually have to choose uncured or sugar-free, not both. In my area, both Whole Foods and the local co-op have options. Here is a good article from Chris Kresser about nitrites that puts to rest some of my fears of consuming cured meat. I still grab the sugar-free uncured stuff at the market when I find it, though! I like making my own ferments (recipe coming soon! ), but Bubbies is the only mainstream brand I know of that still has live cultures. You may be able to find some smaller local brands that offer raw ferments – Firefly Kitchens is one we have here in the Seattle area. I’m excited for that recipe! I’ve been eating fermented veggies daily now and I’d love to make it myself. I buy Bubbies and it is delicious, but it doesn’t last long enough! 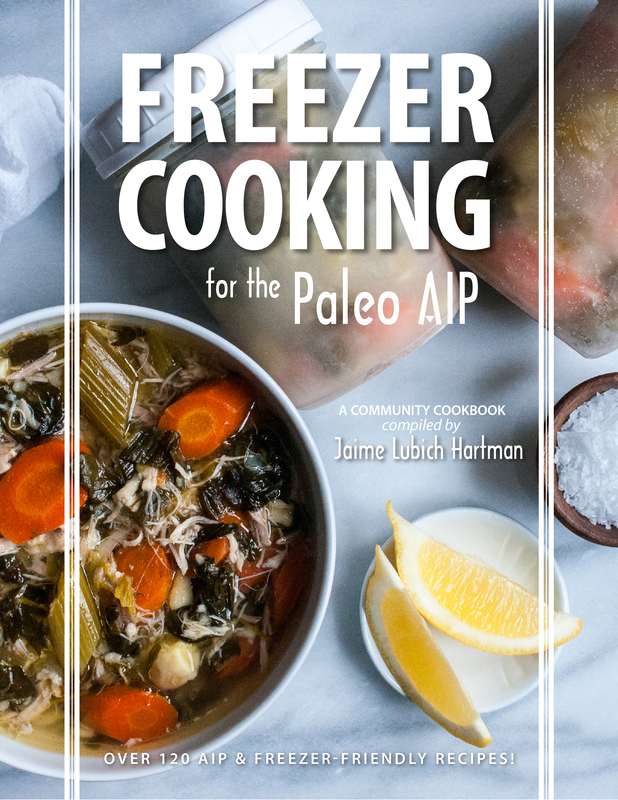 Here is a link to my recipe page, where everything linked is autoimmune protocol friendly. I also try and add 1-2 recipes a week so that list is slowly growing! I meant to say AI friendly DESSERT recipes. Duh! Sorry about that! Aha! I eat tons of fermented veggies, and I do make them myself. I am working on a post for that to be up on the blog soon. I have never noticed a difference for the goitrogenic veggies, so I don’t avoid them. If I suspect something, I always leave it out for a few weeks and then reintroduce to see if I have a reaction. It’s the darn shipping that is so cost – prohibitive. Cultured farms has some great looking cultured veges, but the shipping would be more than the products. Oh brother! Most health food stores have at least one, if not more options, for fermented veggies. There tend to be small, local producers. At the least, sauerkraut, but I find other kinds too. Thanks Mickey! You are such an inspiration. You make breakfast look beautiful. I gave up cultured veggies for the most part at my nutritionists suggestion, but I think they are needed especially since I’m not over sugar addiction. I just need to puree them if they are very fibrous because I may still have narrowed/dilated intestines. I’m still afraid of cabbage (it doesn’t fit my blood type, oh but I miss the red cabbage!! ), so that leaves little store bought cultured veggies. It’s time for me to get back to making my own. I also don’t do cauliflower. Oh well. We all have to come up with substitutions that fit. A good breakfast is so important. Thanks for the reminder. Thanks for this info! Where do you buy the BPA -free canned salmon? We love salmon patties, but I don’t make them often b/c I’m not sure which cans are BPS free. Thanks again! I stress a lot about what to eat on AIP. More than I realize.. I have been on Paleo for several years and cutting out egg here for AIP is hard. I always bring food where ever we go…often hungry. Trying to keep weight on. Been on AIP for a little over 2 weeks. I try to always make extra so I have for later. The herbal patties has really helped to have in the freezer. Thanks for the inspiration. :). Sure helps and I can’t wait for your cookbook to come out. Do you have more ideas for breakfasts we can pre-make and have on hand to grab and take with us on busy mornings? Something that needs no/little prep? I have been eating sweet potato or other root veggies (carrots, beets) along with some protein (herbed beef patties, uncured bacon, something leftover from the night before. I am more satisfied for much longer and somehow the additional carbs seem to have jump started my weight loss again. I have been trying to follow the auto immune paleo diet which means no eggs so it was a challenge, but I feel better and can handle a lighter lunch and then a good supper. I love this blog, although my recipies never turn out quite right! The support on here is so lovely, keep it up!! I’m finding I can’t face eating cooked food in the morning. I used to be a vegetarian,with periods of being vegan. I find I manage a few mouthfuls at best before I feel sick. I’ve only been on aip 1 month, is this to be expected? Many thanks. These breakfast ideas are so great, I’d love to buy your book. But I buy too many books to get print versions. I’d be buried alive! 😉 Do you offer a digital version? Will it be coming soon?